SOS is a reality show-inspired survival game where 16 contestants have 30 minutes to drop on an island, find an artifact, and get out. Developers Outpost Games are counting on leveraging that 90s desire for reality stardom, because they’re putting a big focus on streamers and audiences interacting through the game itself. Have a look at the best survival games on PC. 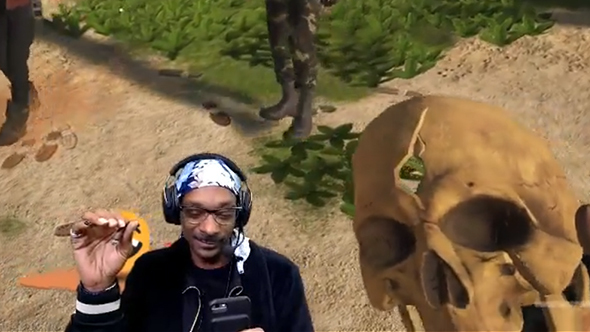 To that end, they put together a launch stream with Snoop Dogg, because why the heck not. It was a solid opener, garnering well over 80,000 viewers, and giving us plenty of clips of Snoop loudly freaking out about aliens. He was also smoking, er, something on stream, and depending on which state he was streaming from that might be a violation of Twitch TOS. If you’re wondering how he managed to play with a substance in one hand and a phone in the other, well, that’s a mystery for another day. That hour long stream will give you a pretty good idea of what SOS is all about, but it’s all built on vocal communication with your fellow contestants, challenging you to make the right alliances (and betrayals) to leave the island intact from the attacks of various monsters. The TV inspirations aren’t just for show, since streaming audiences “become an interactive part of the experience,” influencing games and interacting directly with players. SOS is available now in Steam Early Access for $29.99 / £23.79 / €27.99.